The text widget is the primary tool for adding text to your pages & pop-ups. To get started, simply click and drag it to the location you wish to add text, or use an existing text widget from one of our templates. You can click on the widget directly and start typing to edit your text. We support multiple paragraphs, so you can hit enter to add even more content. Use Shift + Enter to create a new single-spaced line. If you make a mistake, you can use standard undo and redo keyboard shortcuts (command/ctrl-z to undo, and command/ctrl-y to redo). Click the B and I icons in the text widget settings panel to bold or italicize text, respectively. To add an underline or strike-through effect, first click the font icon (Aa), then toggle either option at the bottom of the panel, as shown below. You can also adjust the font, size, and line spacing of your text under the Aa menu. Click the alignment icon between the italics and font icons to toggle between left-, center-, and right-aligned text. Select the bullets icon to create a list with checkmarks, bullets, numbers, or custom icons. 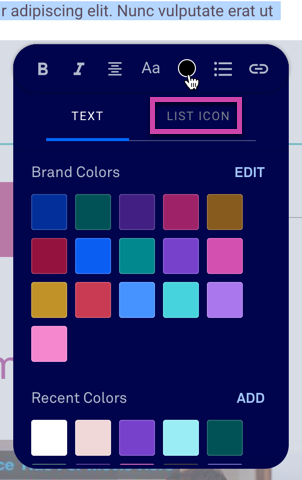 Select the text, click the color picker and then List Icon to edit the color of your list icons. You can link any text to a pop-up, URL, Lead Page, Calendly pop-up or page section. Highlight the text you’d like to turn into a link and click the chainlink icon in the widget settings panel. Then, choose between a URL, Lead Page, or pop-up as your link’s destination. You can also learn more about creating pop-ups here. ​For more on linking options, click here. You can increase the size and spacing of your text to “10” — for larger sizes, consider using the headline widget. To set a default font for text widgets on your page, click the paintbrush icon in the left sidebar, then Type Styles and choose your desired typeface. Alignment and list options affect full paragraphs—all other customization options affect whatever text is highlighted. You can customize the bullet displayed in front of list items by selecting from a list of icons, as shown below. While we do provide a number of Google's most popular fonts, you might have one specific to your brand or business that you'd like to use with Leadpages. NOTE: Applying a custom font using the steps below will change the font of all text. If you want to selectively apply the new font to certain parts of a page, you'd need to replace the * selector with the appropriate classes. This is not something we can assist with. 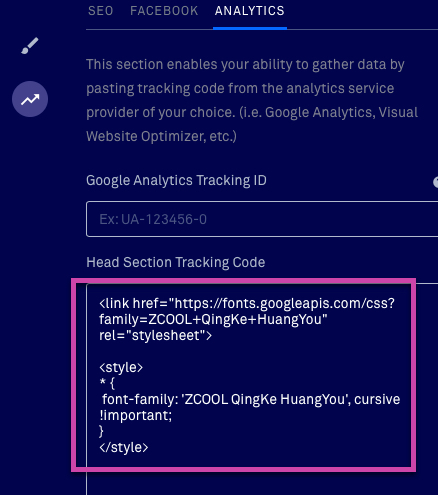 To apply a custom font in Leadpages, navigate to the Tracking tab on the left-hand side of the builder, then Analytics. 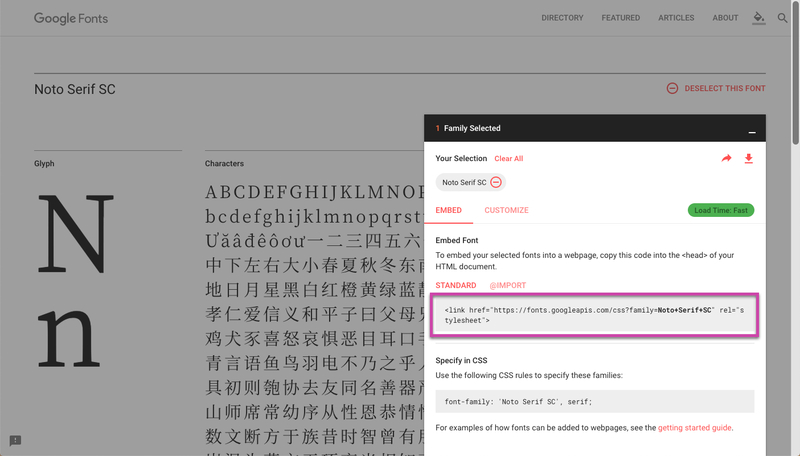 Then navigate to Google Fonts to find your custom font. Once you've selected your font, copy the font's standard embed font link and replace the FONT_LINK_HERE line with it in Leadpages. 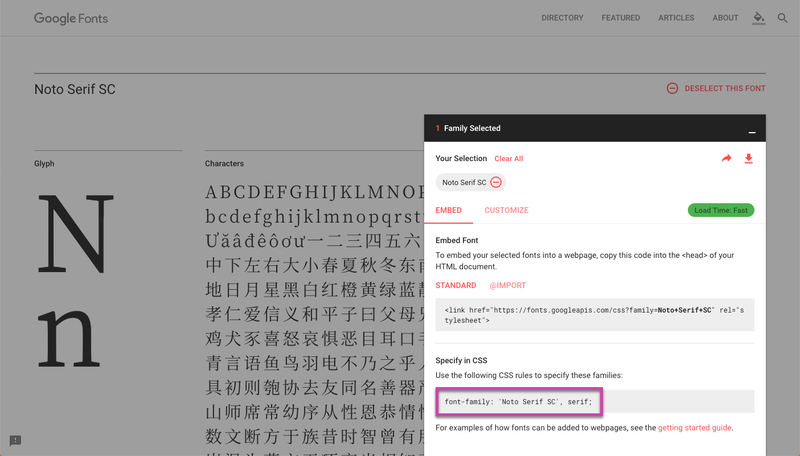 Next, in Google Fonts, copy the text below "Specify in CSS" and replace solely the FONT_FAMILY_CSS_HERE text in Leadpages. WARNING: Do not copy the ; at the end of the CSS from Google. Can I use different icons for each item in my bullet list? Your selected icon will apply to the entire list. However, you can create multiple lists within the same text widget if you separate them with an empty line. What fonts are available? Can I upload my own text/font style? We don’t support uploading custom fonts at this time, though you can use web fonts if you’re comfortable with CSS and HTML. If you’re pairing text with an image or a calendar event, consider using a more specific widget. You can read more about our Image + Text widget here.